We all know it’s not easy resisting the delicious smelling aromas of fresh baked breads and other sweet scented pastries coming from the bakery department. 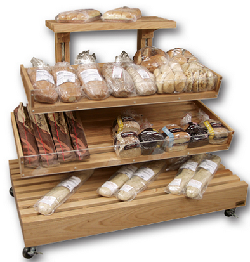 Offer your customers a wide variety of products to choose from by showcasing your goods in one of our various bakery display fixtures and stands. 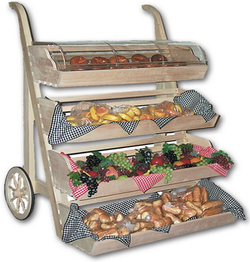 Adding a stylish food display is a great way to entice customers into making the final purchase. 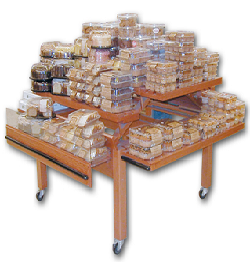 Such merchandising displays like our bakery islands and tables, on rustic appealing wooden carts and kiosk stands, and on our eye catching down-home country style wicker baskets with a pedestal. Select which merchandiser that best fits with your store's decor. Customer's are the #1 reason retail facilities either succeed or fail. Bakeries have the upper hand because they adhere to three of the five senses: smell, taste, and sight! 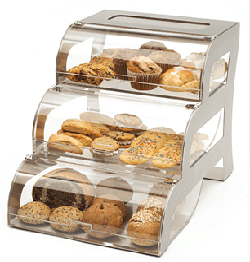 By using food display fixtures filled with fresh baked muffins, donuts, or cookies at your counter-tops, your impulse buying and sales are increasing. Customers get to enjoy their delicious sugar fix too. Keeping your fixture simple yet organized and eye catching makes it easier for the shopper. Yes, the smell will lead them directly to the bakery department and wake up their palates. So close the deal and just make your displays as sweet and tasty as your products appear and see your sales numbers break old sales records and set new ones. That's the final outcome if you're a retail store owner. 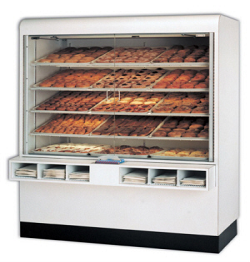 Come and order your bakery displays with us today!